**** Chosen by Winner: Mike M.
Mel Nishiuchi's elegant Gentleman's Linerlock Folder features a flat ground 2.375-inch blade of ATS-34 high carbon stainless steel. 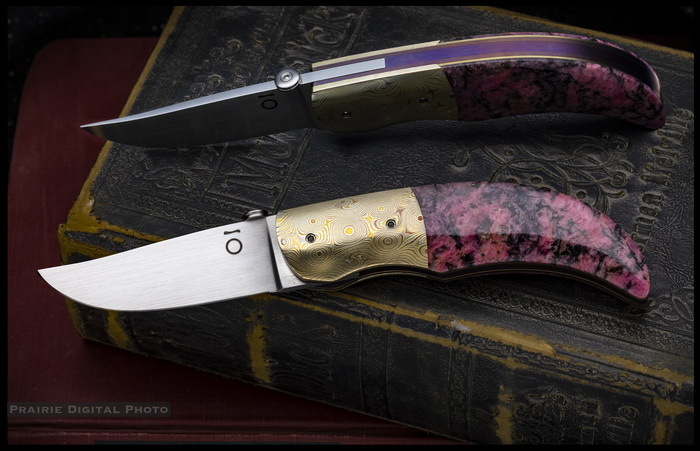 The handle features high grade Rhodonite stone from Australia with dovetailed Devin Thomas Mokume bolsters. The liners, backstrap and thumb stud are anodized 6AL4V Titanium. Opens via thumb disc. Heat treating by Paul Bos with a sub-zero quench to 59-60 Rockwell C. The pivot pin is heat treated 440C. I have been making knives since 1980 with my first knife sold in 1983. All of my earlier knives were made with forged to shape 5160 steel, deferentially heat treated and hand finished in my shop with files and sand paper. The handles were made with exotic hardwoods. I later purchased a Burr King and began fabricating by stock removal and switched first to 440C and later to ATS-34 and stainless steel Damascus made by Devin Thomas. I also began having all of my blades heat treated by Paul Bos. I still use natural materials for handles (Pearl, Ivory, exotic hardwoods and stones) with titanium and/or Mokume by Devin Thomas for fittings. I learned to make Locking Liner Folders from Jay Harris and have been working mostly with precious and semi-precious stones for handles on the folders and on some of my fixed blades. The stones are purchased in the rough and cut in my shop as bookmarked sets. I am a part time maker and produce about twenty knives a year.